The idea of using nanobots to fight disease is something I’ve thought about for a while. 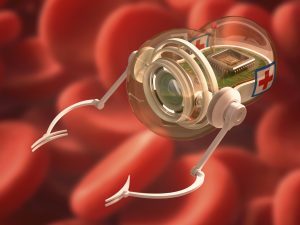 If you’re not sure what a nanobot, it is “a hypothetical, very small, self-propelled machine, especially one that has some degree of autonomy and can reproduce.” Essentially these are extremely tiny robots, 50,000 of them could fit on a diameter of a human hair, that can be deployed to perform specific tasks. For example, what if a nanobot could be programmed to search out specific diseases or issues within the human body and either repair the issue or kill the disease? What if we got as far as where the bots could continue to live inside us and continually scan our body for disease and infection and then either report back or attack the situation? According to the World Economic Forum, researchers are already testing out the possibility of using nanobots to fight cancer. Can you imagine how amazing it would be if we could eliminate chemotherapy and replace it with a less evasive or even non-evasive technology to destroy cancer? Imagine how many millions of lives this would impact!